The very devices that help doctors take care of the most fragile babies also come with big drawbacks. Sensors that measure a premature newborn’s heart rate, breathing rate and other vital signs in the neonatal intensive care unit require electrodes whose glue can hurt and scar a preemie’s delicate skin, and wires that can prevent cuddles and other skin-to-skin contact babies need. Now, researchers at Northwestern University are unveiling wireless soft, ultra-thin, flexible “skin-like” sensors they hope will be the solution. The technology is described in a paper published Thursday in Science: One wireless sensor is placed on the baby’s chest and a second on his or her foot, with the data transmitted via near-field communication, similar to the technology used when people make a wireless payment with a smartphone at a store. It improves on the traditional setup, which involves five or more wires and takes up a “tremendous amount of real estate” on a tiny patient’s body, said Dr. Amy Paller, one of the study authors, chair of the dermatology department and a pediatrics professor at the Northwestern University Feinberg School of Medicine. “If you've ever been in a neonatal intensive care unit, you know that these babies are just covered with a mass of wires,” Paller told TODAY. Skin-to-skin contact is important for both the psychological bond between a parent and a baby, and for the newborn’s health because it decreases the risk of infectious disease and of liver and lung problems, Paller said. More than 80 babies have now been monitored with the wireless sensors — though wired sensors were still in place in each case to make sure there was 100 percent accuracy, she added. Preliminary results show the new sensors perform just like the standard monitoring systems. The new technology can also monitor temperature and continuously track blood pressure. Taschana Taylor, who experienced complications during her recent C-section and whose daughter was whisked to the NICU at Ann & Robert H. Lurie Children's Hospital of Chicago, said the experience was complicated by the traditional sensors. The new technology would also protect a premature baby’s fragile skin, which is much thinner than an adult’s and tears more easily. Up to 45 percent of hospitalized newborns suffer from “skin breakdown,” much of it caused when medical devices attached with adhesives are removed from their bodies over and over again, the researchers noted in the study. When preemies who spent time in the NICU reach age 7, more than 90 percent have scars, they added. 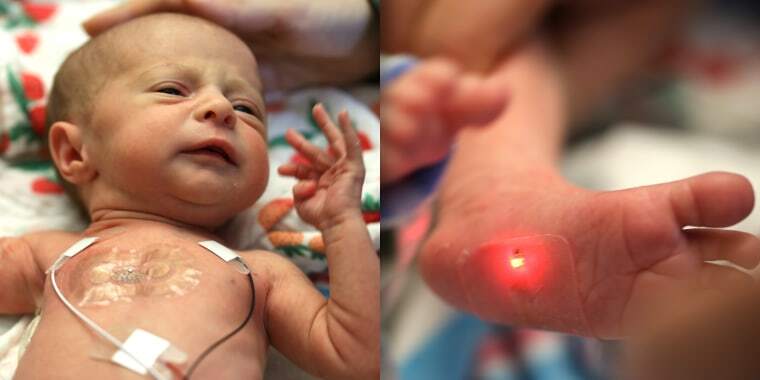 The new thin and flexible sensors can “softly laminate” on a baby’s skin, said John Rogers, one of the study authors and professor of materials science and engineering, biomedical engineering and neurological surgery at Northwestern University. “They can adhere much more weakly, but still robustly, to the surface of the skin, thereby avoiding the risk of skin injury that often happens with the kinds of tapes that are adhering conventional sensors,” Rogers noted. The weight and bulk of the wires also goes away, so babies can move around much more naturally, he added. It also makes it easier for the nurses to clean the tiny patients and engage with them. No harms have been observed with the new technology and the next step is to monitor babies with the wireless sensors but without the accompanying standard wired setup that’s always been in place as back-up so far, Rogers said. The new sensors could also help monitor burn victims and patients in cardiac and adult intensive care units. There are also uses in outpatient care, where people who need to have their chronic disorders monitored outside of the doctor's office could link the wireless sensors to their phone, Paller said.